When it comes to vimdiff, you can get started with this tutorial. Wonderful, thanks! My team currently uses a “legacy” CVS (and we use “cvsvimdiff” – http://vim.sourceforge.net/scripts/script.php?script_id=1209 ) – but this will find from you will be a significant part of my plan to move to git. Thanks for -R in vim :). I’ve been using almost the same function in my bash here, but without -R you have to always remember to type :q! instead of :q. Now it’s gone, thank you one more time :). Thanks for this entry, I found it useful. I will add that this script works if .gitconfig is NOT modified like above. The above script is a small masterpiece, it does not mess with standard config so all tools expecting usual “git diff” still work fine. Have been trying to do something like this for ages. Thanks a lot! I just compared with my config. Just like you, I copied the git_diff snippet from this page and got the same error. The problem is that the dash at the end of the vim command is not the ASCII minus sign, which is used to tell vim that the input must be taken from the standard input. Instead, it’s a long dash symbol, which vim interprets as a file name to create and edit. 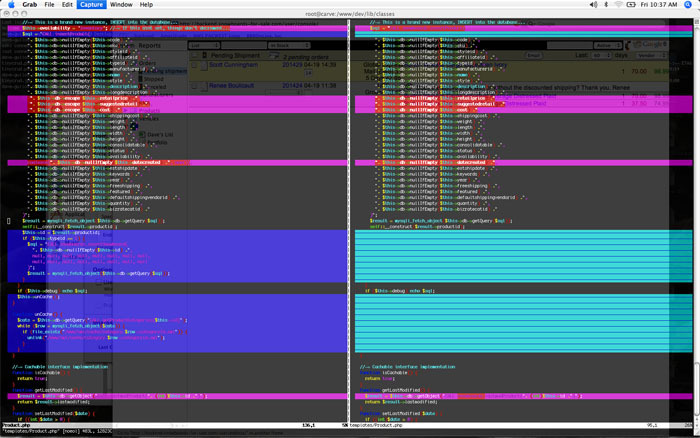 I have a question though: when one has more than 2 files in diff, vimdiff is launched twice. And this gets annoying if you have, say 100 files in diff. Any idea what to do then? Yeah, this is a common problem. And it’s not Vim specific either. I usually check how many files are affected with “git status”. Also, vimdiff git diff is _not_ my default choice: I use the “git_diff” alias mentioned at the end of the post. If you still make that mistake … you can try to kill the git diff process. This will allow you to quit vim anytime by simply pressing Q (of course, if you have unsaved changes you will be prompted first). If you have 10s of files in your ‘git diff’, you can just hold down the Q key to get out fairly quickly. I also tried it but failed with the same error as Pete. The problem is in the extra quote, so I removed the quote in front of “!” , now I don’t get errors but don’t get any valueable results either. git vimdiff simply does not yeild anything. Much easier to use is vimdiff for git-difftool. Just note that this works per file instead of diff on the whole working directory. That is very handy! Is there anyway I can tell it to open in readonly mode? Thanks. This is much nicer than using a wrapper script, or having vimdiff used by default for ‘git diff’. Very nice article.Thanks to the writer for sharing these stuffs that I believe will be helpful for me next time. Thank you. This article was very useful. There is one thing I’m wondering about. Because my main need for vimdiff in viewing git diffs is actually for reviewing code written by others, I’m wondering if there’s a way to do something similar with “git log -p”. In general when I’m doing a “git diff” I’m just looking at code I’ve written over the last hour or so, but when it’s someone else’s code, that’s when viewing a regular diff patch is a little confusing. once, and then use `git difftool` whenever I want to carefully view the diff. You’re right, that works out nicely. Dont forget to change the permissions on your git_diff_wrapper! Hi. First, thanks for the script; it’s been invaluable. Second, I’ve been able to improve it slightly. The problem was if I did git diff (SHA1^1..SHA1) then I’d get a bunch of /tmp/* in the statusline which didn’t really help me. So changing the vimdiff line to ..
recommend? I get so much lately it’s driving me crazy so any help is very much appreciated. frequently affect your placement in google and could damage your high-quality score if advertising and marketing with Adwords. views for ones Report useful means. Thank you, I’ve been enjoying this alot. But yesterday I found gvimdiff is better than vimdiff(We can slide the center bar left or right in gvimdiff). So I just tried changing my git_diff_wrapper #!/bin/sh and gvimdiff “$2” “$5” but it didn’t work. For some reason, it doesn’t open together, just in separate time. Will you please try it with gvim and let me know how to do it?